I am pleased to introduce a little tidbit on how to enjoy Morton’s Steakhouse without breaking the bank. Since I have been to Morton’s before, I am aware of the mouthwatering, yet expensive menu items. However, not long ago, Jonty and I learned about the Bar Bites at Mortons BAR 12.21. Not only is the menu utterly delicious, but from Monday-Friday 5:00-6:30pm and 9:00-close, the items are half price! We were so excited to see what these appetizer-like items were all about. We knew that since it was Morton’s it wouldn’t be some ordinary, standard bar food, and boy were we right! 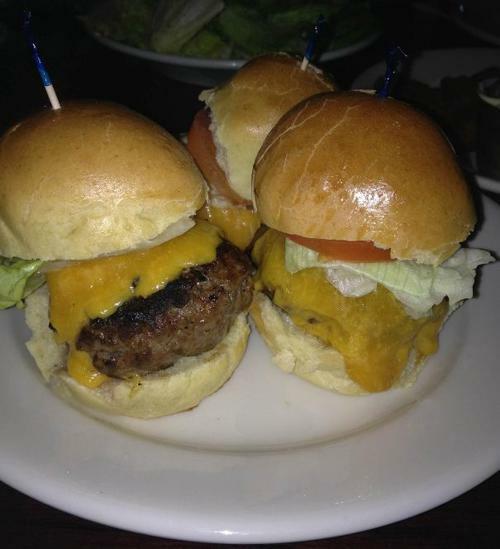 Pictured here are the Mini Prime Cheeseburgers. 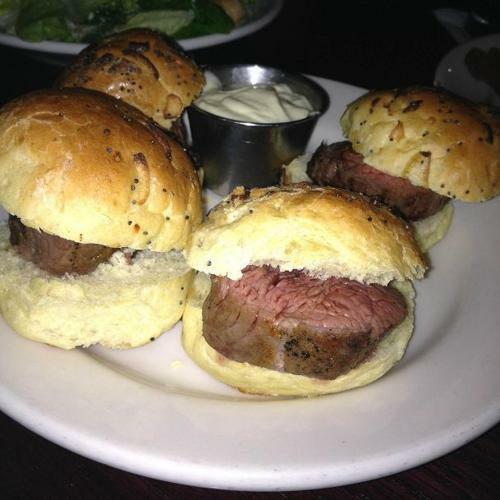 I have bitten into numerous sliders in my day, and honestly these were one of the best I have tasted. They were cooked perfectly on the inside and out, and were incredibly juicy. I really don’t even know if I have words to describe how much I enjoyed these, except for the fact that I ate that third one and could have even ordered more. 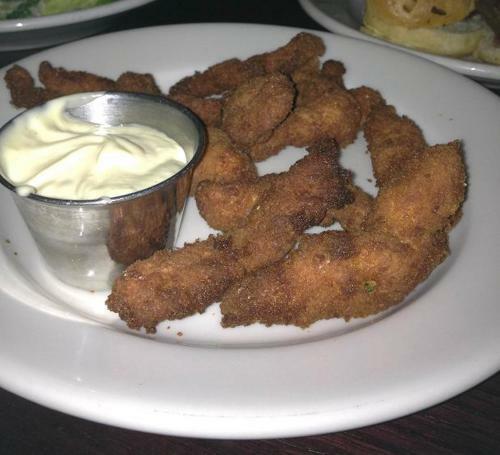 These are the Chicken Goujonettes, which are crispy fried chicken strips served with a side of mustard mayo. We were not surprised that these were also cooked to perfection, composing of a juicy, moist inside, and a crispy, breaded outside. 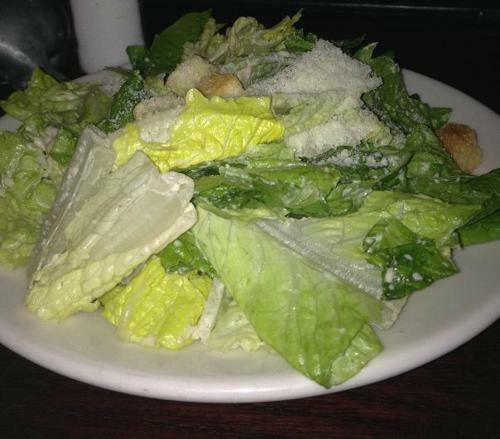 Jonty has a love for caesar salad, so naturally this was one of our choices. It looks like an ordinary caesar salad but the creamy, garlicky dressing was a nice addition to the meal. Since we couldn’t choose between the cheeseburgers or these Petite Filet Mignon Sandwiches, we made an educated decision to get both! And thankfully we did because these were cooked so perfectly with just the right amount of juiciness squeezed between a soft onion bun. Just like pesto makes any savoury dish a thousand times more delicious, so does caramel in the dessert world. I absolutely love caramel anything, especially caramel apples. Rocky Mountain Chocolate Factory has perfected these, but I figured I would take this task to the kitchen. There is always the easy, boring way of melting those caramel squares and dipping apples into them, or there is the more time consuming, yet rewarding way of making caramel from scratch. I chose the latter. The process takes about 45 minutes to an hour in total, but it is totally worth it. 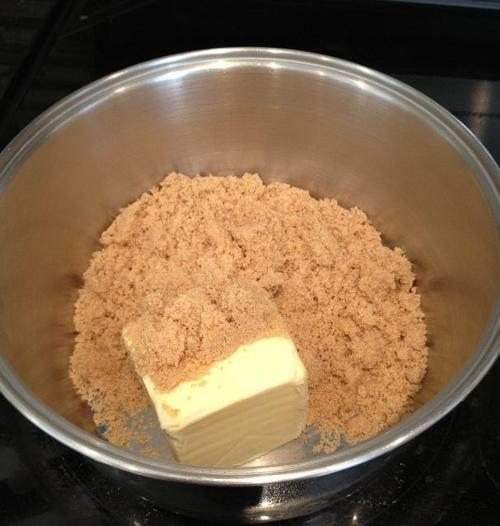 After combining all of the ingredients, you must watch and stir it consistently (see recipe below). When all is said and done, I was left with buttery, creamy, sweet, sticky goodness, in which I dunked Granny Smith apples into. 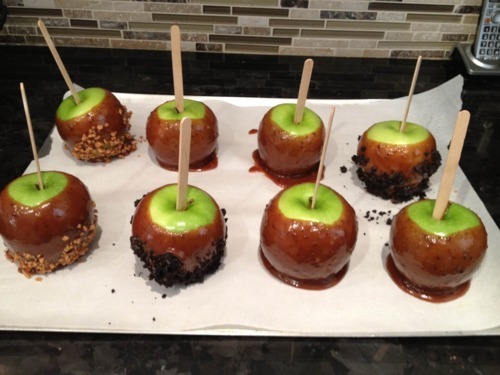 Since I also have a love affair with oreos, I crushed some up and rolled the apples in them, along with skor bits. These caramel apples were literally just as good or better than Rocky Mountain if I do say so myself! They were also a huge hit with my friends and family! Here are some pictures of the process, followed by the recipe. 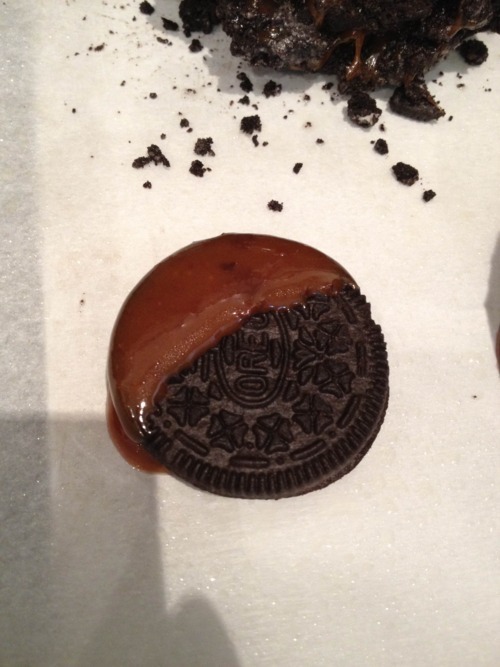 Since I cannot let any caramel go to waste, I used the extra to cover some oreos, which are my two favourite things combined. Nothing can be better than this! 1. Over medium-high heat, stir together the butter, sugar, corn syrup, and condensed milk in a heavy sauce pan. 3. 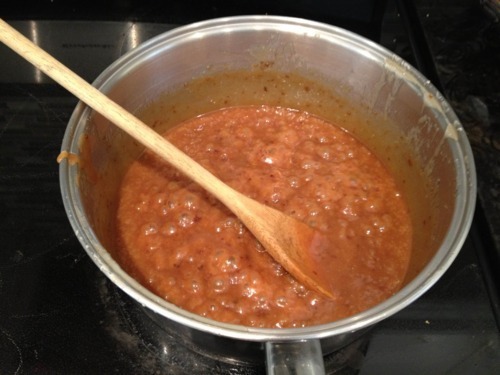 Cook about 30-40 minutes (stirring often), until the caramel darkens and thickens. It should reach the “firm ball” stage of candy-making. This means that a firm ball forms when dropped into cold water. This ball shouldn’t flatten when you remove it from the water, but should still easily change shape when you touch it. The temperature should read 245-250 degrees F with a candy thermometer. 4. 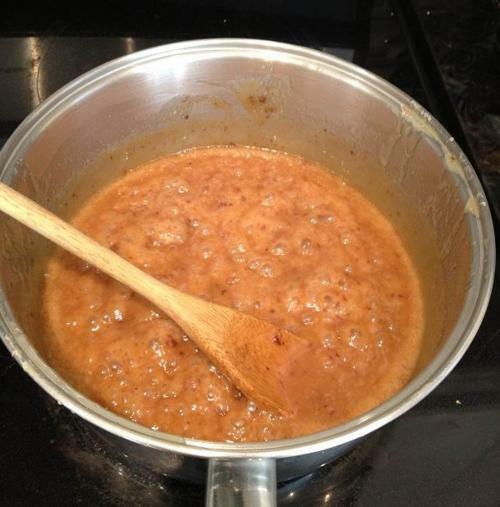 Remove finished caramel from the heat. 6. Dip apples into hot caramel. 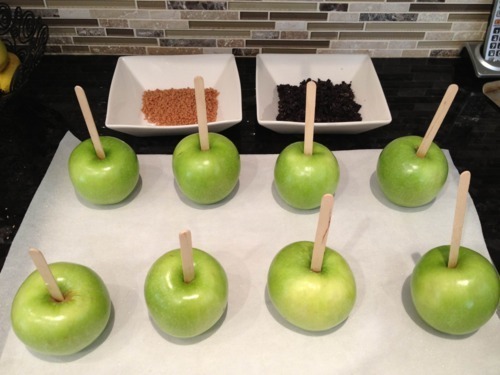 In order to get as thick a caramel coating as possible, dip each apple at an angle and rotate within the caramel. 7. 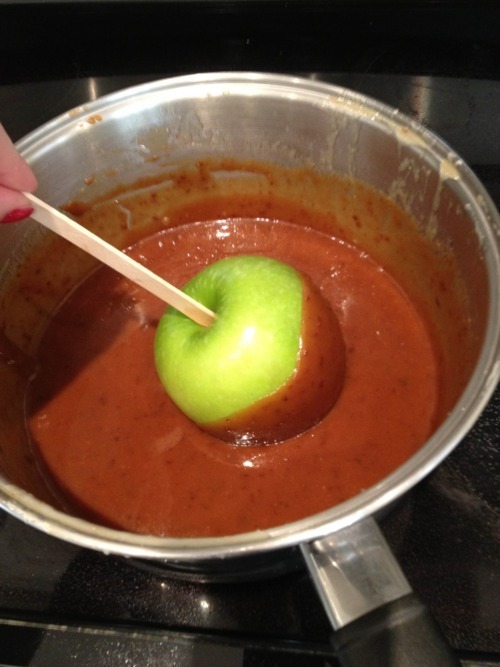 Pull apple out vertically and allow excess caramel to drip off. 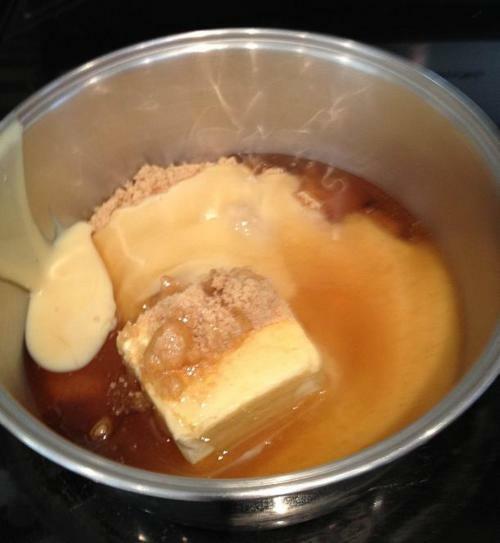 Then turn the apple right-side-up a moment (as if you were about to eat it) and let the caramel settle for a few seconds. This prevents large bare spots at the top of the apple. 9. Place apples on greased wax paper or foil. 10. Let cool to set. I think these caramel apples give Rocky Mountain a run for their money, if I do say so myself!